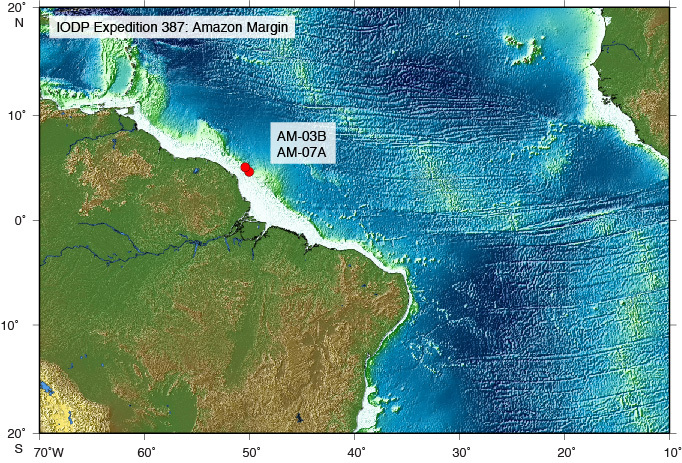 Expedition 387 will drill the upper portion of the Foz do Amazonas basin of the equatorial margin of Brazil to recover a complete, high-resolution sedimentary sequence spanning nearly the entire Cenozoic. This expedition is the marine complement to the Trans-Amazon Drilling Project transect of continental drill sites, and will address fundamental questions about the Cenozoic climatic evolution of the Amazon region, the origins and evolution of the neotropical rain forest and its incomparable biodiversity, the paleoceanographic history of the western equatorial Atlantic, and the origins of the transcontinental Amazon River. Core and log data from sites on the uppermost continental slope will be used to: (1) generate a continuous record of climate and biodiversity in Cenozoic South America at unprecedented resolution; (2) reconstruct the oceanographic conditions of the western tropical Atlantic; (3) provide critical marine biostratigraphic control for correlation with the Trans-Amazon Drilling Project; (4) determine the onset and history of trans-continental drainage of the proto-Amazon River into the Atlantic; and (5) test major hypotheses about the originations and extinctions of tropical South American biota.